The employee of the quarter for the first quarter of 2019 demonstrated excellent teamwork and fortitude during multiple adverse events during this past winter. During this time, public works responded to an EF-2 tornado that ripped across the Bethel corridor. They transitioned from their daily duties to immediately clear the main road and the surrounding residential streets. Weeks of vegetative clean-up followed to return these rights-of-way to a better than original condition. In February, Port Orchard was hit with a 100-year snow event that seemed like it would never let up. The crew transitioned into 12Hr shifts and worked around the clock for eight days and nights to try and keep the roads clear. During this time, a water main broke hindering the crew and forcing them to deal with two urgent situations at once. They worked together to get through both situations at once again showed excellent resiliency and their ability to perform as a team. 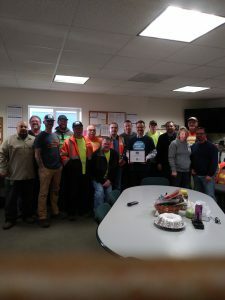 The public works crew demonstrated perseverance and teamwork on multiple occasions during this past quarter earning them the recognition of employee of the quarter.